Inspired by Savannah: My Little Pony Equestria Girls – Magical Movie Night -- Arrives on DVD from Shout Factory on August 8th - Review, #GIVEAWAY + FREE COLORING SHEETS!!! My Little Pony Equestria Girls – Magical Movie Night -- Arrives on DVD from Shout Factory on August 8th - Review, #GIVEAWAY + FREE COLORING SHEETS!!! Disclosure: I was sent a screener copy from the vendor in order to write up an honest review. All thoughts shared are mine and mine alone. Available on DVD from Shout Factory! on August 8th!!!! Even though my garden is enjoying all this rain we have been having on the East Coast lately, I can't say the same about my girls. Every morning when they wake up, they look out the window hoping to see bright blue skies and the sun beaming down. But, for the better part of these past couple of weeks, it has been gloomy and rain for most of the week -- not fun when you only have a few weeks left of summer vacation and want to make the most of it outside. But, thanks to a review copy of the upcoming My Little Pony: Equestria Girls Magical Movie Night that the kind folks at Shout Factory! sent my way, my girls have turned a rainy day into a fun indoor drive in movie day. Dance Magic - When Rarity finds out about a music video competition, she’s eager to convince her friends at Canterlot High to enter the contest. The girls soon learn that Crystal Prep Academy are also interested in participating in the contest. The students at CPA have many more resources and are better dancers! Will they be able to pull together and make a winning music video? Movie Magic - The Equestria Girls have been specially invited by A.K. Yearling to go on the set of the upcoming Daring Do movie and they are overjoyed. For super-fan Rainbow Dash, watching behind the scenes as her favorite heroine comes to life is a dream come true. But when a rare and important prop from the set goes missing, putting the movie on hold, Rainbow Dash’s dream becomes a nightmare. Mirror Magic - As the pages in her journal run out, there’s only one thing for Sunset Shimmer to do: return to Equestria to get a new journal! There, she meets Starlight Glimmer and agrees to bring her back to experience life at Canterlot High. But while Sunset Shimmer was away, a revenge seeking Juniper Montage finds a beautiful hand mirror enchanted with Equestrian magic. Not only can it provide a window into another land, but if you push the right button, it can also make things disappear into limbo, trapped between the two realms! **There is also a fun bonus sing-along not to be missed. My girls sat through this whole DVD, which has a run time of 66 minutes. And, like all the other MLP movies and episodes they have seen in the past, they were quick to ask to watch it again. We have only had this DVD for a few days, but it has become a staple on car rides and on those rainy days that leave the girls indoors to find something fun to do. 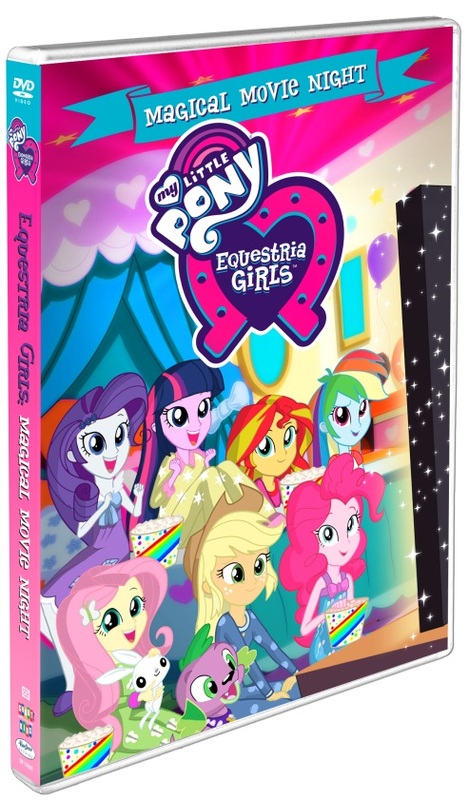 Usually they will watch this DVD and then gather up their MLP Equestria Girls dolls and act out scenes. And, when they are done with that, they are either asking for coloring sheets I find online of the characters, or are doodling their own versions of Pinkie Pie, Sunset Shimmer, etc. 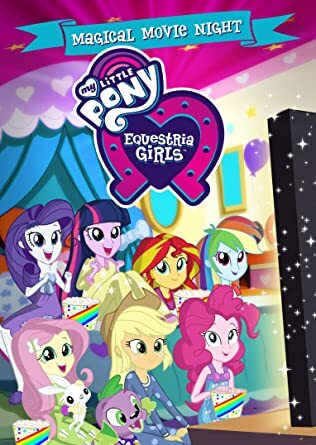 If you have a MLP Equestria Girls fan in your life, then you will want to make a point to pick up this new DVD when it hits store shelves on August 8th. And, right now with a price of only $6.63 for pre-order from Amazon, you can't go wrong with this purchase. I also placed an order so that I could leave a copy of this DVD at my parents house, so my girls will have something to watch when they have sleepovers. 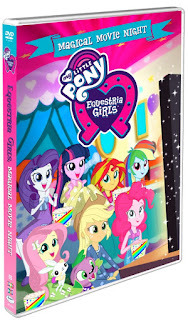 My girls LOVE this new DVD, and I love you and your MLP fan will, too. So, don't delay in pre-ordering your copy of this upcoming DVD release today. Thanks to the kind folks at Shout Factory, two lucky Inspired by Savannah readers will have a chance to win a copy of this upcoming August 8th DVD release. To enter this giveaway, please complete the entries on the Rafflecopter form below. Good luck! Hasbro (NASDAQ: HAS) is a global play and entertainment company committed to Creating the World's Best Play Experiences. From toys and games to television, movies, digital gaming and consumer products, Hasbro offers a variety of ways for audiences to experience its iconic brands, including NERF, MY LITTLE PONY, TRANSFORMERS, PLAY-DOH, MONOPOLY, LITTLEST PET SHOP and MAGIC: THE GATHERING, as well as premier partner brands. The Company's Hasbro Studios and its film label, Allspark Pictures, are building its brands globally through great storytelling and content on all screens. Through its commitment to corporate social responsibility and philanthropy, Hasbro is helping to make the world a better place for children and their families. Hasbro ranked No. 1 on the 2017 100 Best Corporate Citizens list by CR Magazine, and has been named one of the World’s Most Ethical Companies® by Ethisphere Institutefor the past six years. Learn more at www.hasbro.com, and follow us on Twitter (@Hasbro & @HasbroNews) and Instagram (@Hasbro). I'd love go win it for my grand baby! I would love to win for my 3 girls. They love My Lil Pony! Thanks for the chance! !